The ankylosing spondylitis is shown by constraint and dorsodynias, damage of sacroiliac joints and distribution of pathological process on joints and circumarticular fabrics of lumbar, chest and cervical departments of a backbone. Approximately at a half of patients also arthritis of peripheral joints takes place. The illness usually affects young people and middle-aged persons, however sometimes it begins in the childhood, as a rule at boys 8 years are more senior. The expressed correlation of an ankylosing spondylitis with HLA-B27 antigen is noted. Morphological changes of synovial tissues of the affected joints are similar to the changes observed at a pseudorheumatism. Clinically ankylosing spondylitis differs from a pseudorheumatism on a number of signs: 1) damage of sacroiliac joints and lumbar department of a backbone is characteristic; 2) males are ill mainly; 3) the adults sick with an ankylosing spondylitis, seldom have a rhematoid factor; 4) rhematoid small knots meet extremely seldom; 5) the acute iridocyclitis arises very often; 6) the aortitis with development of insufficiency of the aortal valve can join; and 7) the illness has the expressed family character. Clinical manifestations. Peripheral arthritis can be the first manifestation of an ankylosing spondylitis and often has tranzitorny character. Most often large joints, especially joints of the lower extremities are surprised. Pain in heels is often noted. At considerable number of patients joints of feet, shoulder joints and temporal and mandibular joints are surprised. The affected joints can be painful, pripukhla, skin over them warm to the touch. Fig. 14-16. Loss of mobility in lumbosacral department of a backbone at the boy with an ankylosing spondylitis. At an inclination the lower part, a backbone remains to a straight line. Characteristic damage of sacroiliac joints and lumbar and chest departments of a backbone can come to light at the very beginning of a disease or arise months and even years later. Pains in the bottom of a back, in a pelvic girdle and in hips are typical. Pains often have tranzitorny character, are more expressed at night and abate at the movement. Then there is a constraint of lower parts of a backbone with loss of its mobility (fig. 1). In typical cases damage of a backbone begins with sacroiliac joints and extends in the ascending direction, occupying lumbar, chest and, at last, cervical departments. Unlike it at a juvenile pseudorheumatism the cervical department of a backbone is surprised, and lumbar and chest departments remain intact. At early stages of a disease excursion of a thorax owing to damage of costovertebral joints can already decrease. Subfebrile condition, anemia, anorexia, fatigue and a growth inhibition can be noted. In the family anamnesis often there are instructions on the similar cases which are followed by arthritis and an acute iridocyclitis. Progressing of an ankylosing spondylitis can stop at any stage or proceed for a number of years, leading to damage of all backbone and almost full loss of its mobility. The forecast concerning a functional outcome usually favorable if the correct posture is kept. Deformation of peripheral joints meets seldom, but at some patients destruction of hip joints develops. During this or that period of an illness the acute iridocyclitis arises approximately at 20% of patients; at children cases of development of an aortrit are not described, however this complication occurs at considerable number of adult patients with an ankylosing spondylitis. Datas of laboratory. The laboratory tests specific to an ankylosing spondylitis, do not exist. Though 95% of patients are HLA-B27 antigen carriers, the fact of its detection cannot form the basis for statement of the diagnosis. SOE can be raised. Anemia meets, as well as at a pseudorheumatism. At the same time rhematoid factors are found in rare instances. 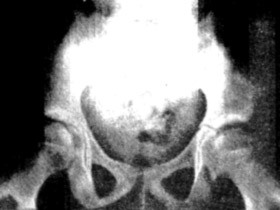 Damage of sacroiliac joints comes to light radiographic (fig. 2) usually in the first 3 — 4 years of an illness; destruction of joints progresses and conducts finally to an obliteration of joints. Characteristic radiographic changes of lumbar and chest departments of a backbone arise at later stages of an illness. Fig. 2. The roentgenogram of pelvic bones at a dalekozashedshy sarkoleit at the boy with an ankylosing spondylitis. Both sacroiliac joints are sclerosed, joint cartilages of an erozirovana, joint cracks are expanded. Differential diagnosis. The ankylosing spondylitis should be suspected at each child with the persistent pains in hip joints, hips or a lower part of a back which are combined with peripheral arthritis or without it. In similar cases quite often make the diagnosis of an oligoartritny form of a juvenile pseudorheumatism. A necessary condition for statement of the diagnosis are radiographic changes of sacroiliac joints, however they can come to light only after a row of years. In addition to an ankylosing spondylitis at each child with resistant dorsodynias it is necessary to exclude, tumors of a spinal cord, anatomic defects or infections of vertebrae and intervertebral disks, and also Sheyermann's illness. Persistent pains in hip joints and hips can be noted at an illness of Legga — Pertes and sliding of an epiphysis of a head of a femur. Ulcer colitis, regional enteritis, psoriasis and syndrome of Reuters can be also followed by the spondylitis reminding an ankylosing spondylitis. Treatment. Main objectives of treatment of an ankylosing spondylitis are removal of pain, preservation of a correct posture and functional integrity of a backbone. Reception of salicylates can be sufficient for removal of pains. Indometacin and phenylbutazone give a certain effect, however at children these drugs should be used with care. There can be effective also latest nonsteroid drugs; from this group now only tolmetin it is allowed for treatment of children. Drugs of gold are considered as inefficient; indications to corticosteroid therapy arise very seldom. X-ray beam methods of treatment are contraindicated. Maintenance of a correct posture is important for preservation of normal function of a backbone; it is possible to use the physical exercises intended for development of a correct posture and strengthening of muscles of a back. Patients have to sleep on a firm mattress or a board, it is recommended to sleep on a thin pillow.